In a recent autobiography, Susannah Cahalan details her experience of waking up, strapped to a hospital bed, with no memory of the past month, to be informed by doctors that she had been exhibiting bouts of psychosis and severely unstable behaviour. Medical tests threw up no clues as to the cause of her condition. As time passed she became increasingly catatonic and the illness became life-threatening. That was until an expert finally tested for a just-discovered autoimmune disease, an illness that was essentially causing her own immune system to attack her brain. These types of disorders, termed autoimmune channelopathies, were discovered only in the last few decades and are still not fully understood. They are part of the wider family of channelopathy disorders which occur as a result of abnormalities in ion channels in the brain, and may arise either due to genetic mutation in the channel encoding genes or due to an autoimmune attack as in Susannah’s case. 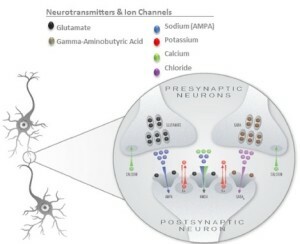 These ion channel abnormalities lead to irregular synaptic function and are known to cause diseases such as certain ataxias, and may be implicated in numerous others including schizophrenia. The population dynamics are approximated by a mean field reduction, where average channel properties control the synaptic activity at each population of cells. This synaptic activity represents neurotransmitter and voltage-gated ion channels with distinct dynamics. Reproduced from Gilbert et al. One of the more terrifying aspects of the ordeal suffered by Susannah and the many other people afflicted by these types of disorders is the difficulty in obtaining a diagnosis. The presentations tend to be highly diverse and hard to predict, meaning that making a definite link between a specific ligand or voltage-gated ion channel and its ultimate consequence is challenging to say the least. While genome sequencing techniques provide vast amounts of information on an individual’s DNA, it has been found that mutations may occur in genes known to link to specific disorders, even in individuals who never exhibit any signs of the disease, meaning that this method may lead to false diagnoses. Techniques such as position emission tomography and magnetic resonance spectroscopy allow observation of metabolic changes in the brain but provide no direct measurement of neural function so are of limited use in locating particular ion channel abnormalities. Monitoring brain function is a useful way to examine the operation of neural circuits, however there is currently no non-invasive method to obtain this information. A new technique developed by Gilbert et al. aims to tackle the challenging subject of channelopathy diagnosis using a new method to analyse data obtained from electroencephalography or magnetoencephalography. Electroencephalography uses electrodes placed on the scalp to monitor changes in voltage caused by the flow of ionic current within the brain due to neural activity. In particular, it can be used to measure response to a specific stimulus by detecting an event related potential. Magnetoencephalography is essentially the same method but instead uses superconducting sensors placed around the head to monitor magnetic fields produced by ionic current flow. Response to stimuli is detected as an event related field rather than potential. Magnetoencephalography and electroencephalography techniques are nothing new, to the contrary they are commonplace in clinical setting and this data is already often obtained as part of a standard diagnostic process. The novelty of this newly developed method is in the way that the data is processed, in this case using a scheme derived from dynamic casual modelling. Dynamic casual modelling describes brain activity and response using sets of ordinary differential equations which describe how membrane potential changes in cells as a response to communication from other cells. The equation parameters are related to brain conductivity, i.e. how strong particular connections are. By taking a neural mass model which forms a part of the dynamic casual modelling options and extending it to cover ligand gated channels in addition to voltage gated channels, Gilbert et al. were able to connect the model to channelopathies. Using the equations and parameters laid out by this biophysical neural circuit model, it was possible to take data from magnetoencephalography tests and identify probabilistic markers that could be predicted to relate to the synaptic function of an individual. This was tested in an experiment in which 2 patients with known ion channel abnormalities were exposed to auditory stimuli while under magnetoencephalography observation, in addition to a control group of 94 healthy individuals. Patient 1 suffered from potassium channel gene mutation, leading to a presentation of Anderson-Tawil syndrome which causes periodic paralysis, arrhythmia and developmental abnormalities. Patient 2 had a calcium channel gene mutation, presenting with episodic ataxia causing sporadic instances of severe discoordination. Each participant out of the total 96 underwent two sessions during which their response to auditory stimuli was measured. Since the parameters of the neural mass model encode channel function, the team were able to construct a template for healthy operation using the control group and use this to locate potential abnormalities in the 2 test subjects where the measured parameters deviated from the model expectation. Source localized event related responses: An inverse solution constrained via a multiple sparse priors identified bilateral sources of activity in both patients at temporal and frontal sites for both trial types. Illustrated here are the MIPs (maximum intensity projection images from each subject at 100 msec). For Patient 1, 96% of the sensor data variance (jet-scale insert) was explained for both trial types using a 512-dipole mesh. For Patient 2, 95% of the sensor data was explained for both trial types using a 512-dipole mesh. Reproduced from Gilbert et al. The results obtained were promising; for the postsynaptic potassium leak parameter and presynaptic calcium parameter. The receiver operating characteristic was computed and these results summarised using the area under the curve (AUC). For the parameter relating to potassium leak, i.e. that associated with patient 1 the AUC value was found to be 0.94, with 1 being a perfect score. For the calcium parameter linked to patient 2 it was slightly lower at 0.76, however still well above the 0.5 threshold at which sensitivity and specificity become equal. It is clear therefore that this method has the potential to identify abnormalities in ion channel function by comparing parameters of a neural mass model from a healthy control cohort with that of a patient. Current neural models for the postsynaptic region are far superior to those of the presynaptic region which likely explains why the AUC value for parameter 2 was significantly lower than that of parameter 1. However, the fundamental principles underlying the novel methodology employed here hold up to statistical analysis and therefore hold promise in terms of future development into a diagnostic tool. 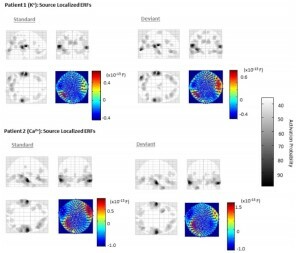 The ability to identify highly localized abnormal synaptic activity using non-invasive magnetoencephalography and electroencephalography data collection could have a huge impact on the way in which channelopathies are diagnosed, potentially saving many people with such diseases from the agonising period in which no diagnosis can be found. While both patients in the study suffered genetic mutations, there is no reason to believe that the same method could not be applied to the autoimmune type as the model is based on channel dysfunction which would be present in either. It is unlikely that this method could be used to perfectly identify a specific mutation in any given patient with no previous knowledge of the type of disorder present. However it could still be invaluable as a tool to narrow the vast and complex diagnostic field with no invasive procedure needed. The beauty of using electroencephalography or magnetoencephalography data is that the infrastructure is already in place; use of this tool simply requires a deeper analysis of the waveform produced. Where typically the waveform is observed by eye for key topological differences, here the entirety of the waveform and all its properties are utilised to compute detailed results. Through the power of detailed neural mass modelling, patients suffering from hard to diagnose neurological problems may be able to undergo more targeted and effective treatment based on strong diagnoses of specific mutations.